Fear Itself crashes to a conclusion in the month of ghouls and ghosts - and the landscape of Marvel is changed as a result! An old face returns to the Thunderbolts, the Hulk-verse spawns another title, Wolvie gets his own X-Men and there's the Marvel 50th Anniversary cover variants! Speaking of covers, of all Marvel's in October, these four are tops. COVER OF THE MONTH: STEVE MCNIVEN - CAPTAIN AMERICA #4 Sure it looks like Cap's in a spot of bother here, but what you forget is Cap can get out of anything. More than a human swiss-army knife, he's just like MacGyver dressed in the American flag. 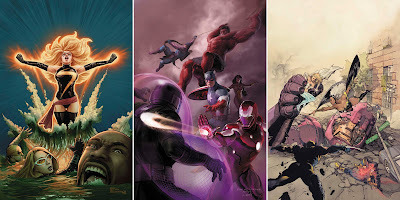 CLOSE CONTENDERS: (All Marvel 50th Anniversary variants - look familiar?) John Tyler Christopher - New Avengers #17, Ryan Meinerding - Avengers #18, and Leinil Yu - X-Men #19. 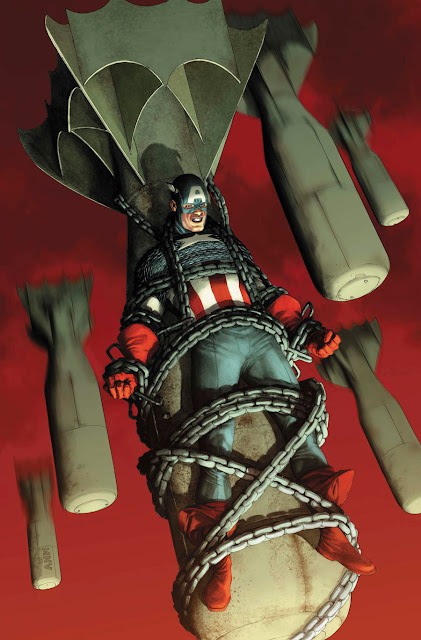 For more Marvel October solicits click the jump. I'm torn between that great X-Men pic and the one of Ms. Marvel. I think I'm leaning toward the latter though. I'm going for Ms Marvel too Craig - I think what would have sold me on the Avengers X-Men #1 homage would've been the original avengers in the shot. Although come to think of it Avengers #1 and X-Men #1 aren't that different cover wise in layout after all. Cap is Marvel's Batmen, in the best sense of the concept. Strapped to a bomb that's about to explode? Pshaw; to others that may be a problem but Captain America or the Dark Knight call that Monday. Why do the bad guys even bother trying? Exactly Pensol! Frankly I'm surprised he's not yawning!